Paul and Julia Child, who had both worked for the Office of Strategic Services, moved to Paris when Paul accepted a job as an exhibits officer with the United States Information Agency. With this much weight on one dish, I was a little intimidated that I would be able to do it justice. I also wanted to try it in the blur of a weeknight, since the instructions in Julia’s cookbook “The Way to Cook,” indicated that it could be put together in literally minutes. At my corner market there was no sole, but there was a nice piece of local cod, which doesn’t turn up too often because of heavy fishing regulations. I set out several aluminum pie tins to bread and flour the fish (Julia says she keeps several on hand for this kind of thing) and pulled out my homemade breadcrumbs from the freezer. 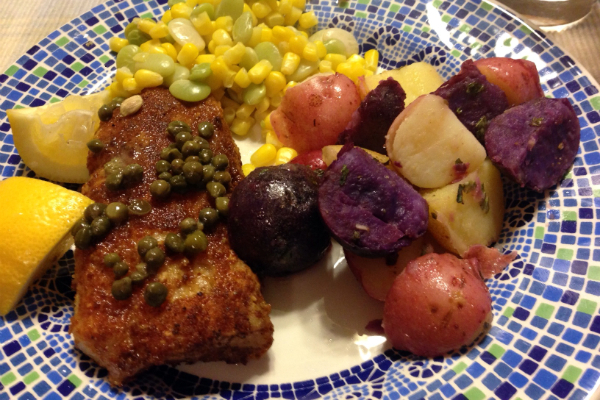 I decided to steam colorful baby potatoes and heat up frozen succotash I had on hand to go along with it. I clarified some unsalted butter (also known as ghee), Julia recommends this, and it only takes minutes. Simply heat tablespoons of butter in a saucepan until it boils, and let it boil away until it stops crackling. The point here is to get rid of excess moisture, which deepens the buttery flavor. Once it has stopped crackling, pour the melted butter through a tea strainer or cheese cloth into a ramekin. Clarified butter will keep for several months in the refrigerator. I also took the extra step in breading the fish, after you dip it in flour, shake off the excess and then quickly dip into an egg beaten with a little oil, and then into about a 1/2 cup of breadcrumbs. Be sure to do this only moments before you are going to add the filets to the pan, or the breading will get mushy. I forgot to pick up fresh parsley, but I decided to try capers. Up to this point, I haven’t really cared for capers. This dish changed my mind. One or 2 minutes on each side, and my sole (cod) meunière was ready. I took a bite – wow. The hurried pace of my day slowed down and I focused in right where I was. Buttery and light, the crispy outer layer gave way to a delicate fish that was, for once, not overcooked. If I could be impressed by sole meunière in a tiny Boston apartment at my first attempt, I can only glimpse what Julia must have experienced all those years ago during an afternoon in Rouen. 1. Layout and pat dry the fillets. Season with salt and pepper. 2. Dredge in a light coating of flour, brushing off excess with your fingers. 3. In a skillet on medium-high heat, pour in clarified butter and heat until just before browning. 4. Place filets in the pan, without overcrowding, about 3 to 4 a skillet. Brown on one side about 1 to 2 minutes, and carefully flip over to brown the other side. 5. Remove fish to platter, and if using, add capers to butter and heat for a minute. Pour capers and butter over fish. 6. Garnish with lemon and fresh parsley. Serve. Wow! I’ve been thinking about trying this–for the same reason, Julia inspired me-looks so good! It is hard to overestimate the effect Julia Child had on American women and our cuisine. Exposure to Europe through returning soldiers and increased tourism to France after WW II combined with the allure of Jacqueline Kennedy’s sophistication to set the stage for Mrs. Child’s entrance. Her book, aimed as it is at “…the servantless American cook,” captivated us all. Thank you for this lovely post.